Xiamen, China – 27th November 2018 – Yealink, the leading global provider of enterprise communication and collaboration solutions, is pleased to release its new DECT Conference phone product CP930W as of today, which is based on reliable and secure DECT technology to free users from the limitations of power outlets and Internet ports, and to handle wireless meetings at any place with convenience. Equipped with Yealink Noise Proof Technology, multiple microphone arrays, advanced features and user-friendly design, Yealink’s audio conferencing solutions are designed to power productive remote collaboration. 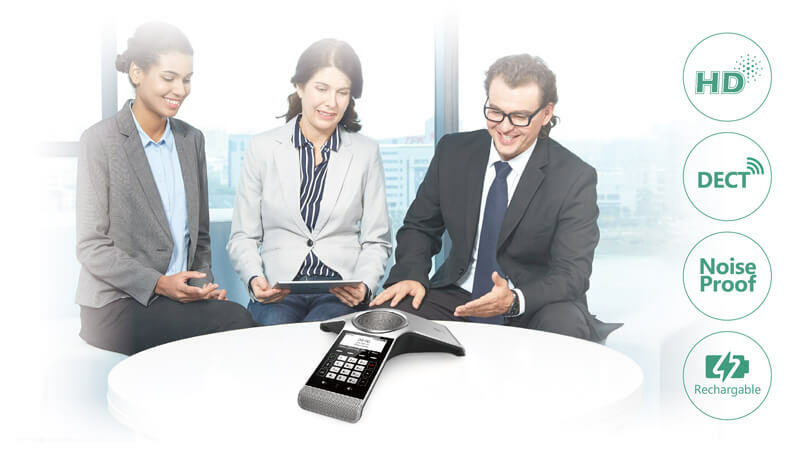 Outstanding in delivering full-duplex and HD audio quality, Yealink CP930W, as well as other Yealink Conference Phones, distinguishes itself by providing the users with premium audio experience without any annoying distractions in complicated environments. With the development of Yealink Noise Proof Technology, the phones are empowered to intelligently eliminate possible noise when the voice of a speaker is detected or automatically mute the microphone when no human voice is detected. Embedded with 3.1-inch, 248x120-pixel graphical LCD display, the CP930W allows its users to implement main conferencing functions with a simple click on the sensitive touch keypad. Moreover, the three one-touch mute buttons with LED indicators make the switch between mute and unmute easy and accurate. By pairing with Yealink W60B DECT base station, which supports 50 meters of indoor / 300 meters of outdoor coverage, the CP930W can be used anywhere conveniently and flexibly within the signal reception range. In addition, the robust rechargeable battery noticeably strengthens the competitiveness of CP930W with up to 24 hours of talk time / 360 hours of standby time. The key to effective collaboration is to hear and understand other participants clearly. In this light, the vision of Yealink’s audio conferencing solutions is to offer easy conferencing and clear communication with a balance among quality, user experience and affordability. Founded in 2001, Yealink (Stock Code: 300628) is a global leading provider of enterprise communication and collaboration solutions, offering video conferencing service to worldwide enterprises. Focusing on research and development, Yealink also insists on innovation and creation. With the outstanding technical patents of cloud computing, audio, video and image processing technology, Yealink has built up a panoramic collaboration solution of audio and video conferencing by merging its cloud services with a series of endpoints products. As one of the best providers in more than 140 countries and regions including the US, the UK and Australia, Yealink ranks No.1 in the global market share of SIP phone shipments. For more information, please visit: www.yealink.com.